Sunday 17th March at 7.00 p.m. Certificate PG ~ 97 minutes. The true story of Hollywood’s greatest comedy double act, Laurel and Hardy, is brought to the big screen for the first time. 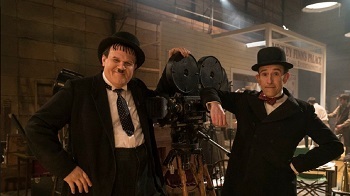 Starring Steve Coogan and John C. Reilly as the inimitable movie icons, Stan and Ollie is the heart-warming story of what would become the pair’s triumphant farewell tour.